What makes us proud to be Americans? I’ve been asking myself this question a lot lately, and to be quite honest, I really don’t know how excited I should be to belong to the US of A. The economic woes of the past 4 years has really led us to be pretty ho-hum on patriotism and national pride. There seems to be this prevailing idea that our glory days are behind us, that the empire is now on the downward slide, and many of us have even resigned ourselves to the evidence that soon China is going to be the big kid on the block. This terrifies some of us, reigniting feelings of fear that we haven’t felt since the Commie-hunting days of McCarthyism. Then there was the election (thank goodness it’s over! ), in which both sides of the aisle did their part to even further the apparent gaps that exist in the politics of America. There was a time where democracy was meant to unite the people, and be a joy to participate in, because we were the one’s deciding our future; we were given a voice. But it has become a nasty affair that does not promote unity, but causes people of differing views and opinions to go at each other’s throats. When did Facebook become the megaphone for dissent? Who came up with the idea to flood the internet with hate and ignorance? Enter stage left, Ben Affleck and his gnarly beard. In November of 1979, the United States Embassy in Tehran was invaded by militant Iranian revolutionaries, where they quickly took control of the facility and captured 56 American citizens as hostages. Angered by the decision of President Carter to grant asylum to the former Shah of Iran, who was thrown from power by means of revolution, the revolutionaries made the promise that until the Shah was given back to the Iranians to face trial and execution, the Americans would remain prisoners of the Iranian people. The whole world was watching, and tensions built on both sides as attempts of diplomacy failed over and over agin. But, unbeknownst to the rest of the world, six American citizens escaped from the embassy during the raid, and found refuge in the home of Canadian Ambassador Ken Taylor. This handful of people were now stranded in Tehran, a city that was becoming a powder keg of violence, living in constant fear that if they were to be found out, they would be killed in the streets. ‘Argo’ is the true life story of CIA officer Tony Mendez (Ben Affleck), and how by impersonating a film crew for a B-rate Sci-Fi film, he led a mission to extract these six Americans safely out of Tehran. Written by Chris Terrio and brilliantly directed Ben Affleck, ‘Argo’ is not only intriguing and engrossing, but it is also the best two hours of entertainment that you will be able to find in a movie theater. Edge of your seat suspense, coupled with moments that will make you grin from ear to ear, make this one a Hollywood gem; an instant classic. In my mind, ‘Argo’ really does something amazing. Right from the word ‘go’ it captures us with the raid on the embassy in Tehran, which I am willing to say in November, is the most compelling scene of film that was released this year. It keeps the audience engaged in the excitement, gripping at the conclusion of the film, and it does this without the bullets and bombs that are usually necessary to keep people interested. The climax is done the old fashioned way, by setting the stage of danger in Iran, creating characters that we share common ground with, and forces them to accomplish a feat that is, to both the viewer and the characters, seemingly impossible. Who would have thought that real espionage could be this wonderful? The strengths of this movie are everywhere, but it starts with a great script by Terrio, who is able to take this big event from our history, and give an adaptation that makes us feel as though we are right back in the middle of the crisis itself. The dialogue is snappy and fresh, filled with purpose, and is all about the storyline, getting us from point A to point B with style and ferocity. But it’s not only the story that makes the writing marvelous, but it is also Terrio’s attention to creating great characters, how through moments of revealing dialogue, the audience begins to like these people more and more with every passing frame. But we can’t give Terrio all the credit for creating great characters; you have to throw praise in the direction of the actors, and ‘Argo’ showcases performances in both lead and supporting roles, making this is very strong ensemble cast. 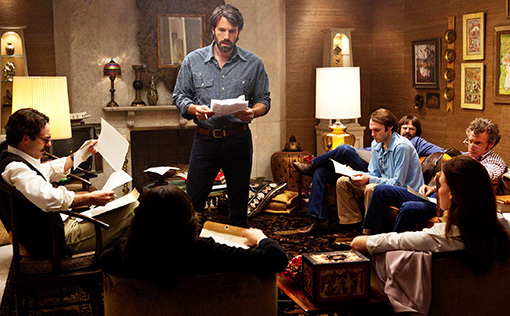 I’ve seen bits and pieces of criticism of Affleck’s performance in ‘Argo’, and after seeing it twice, it’s obvious to me that they were not watching the same movie that I was. Affleck is a spot on lead, giving us a hero we believe in, an underdog of a spie. What’s not to like? 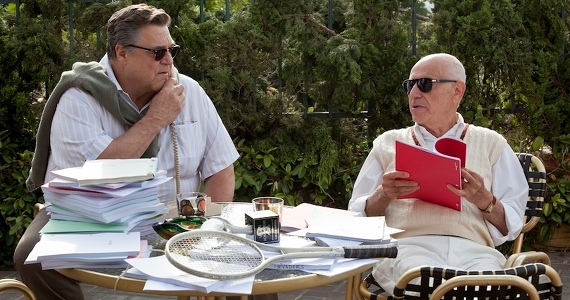 And positive reviews have been falling from the sky for these two actors, but not enough can be said about John Goodman and Alan Arkin, who play Hollywood big-wigs John Chambers and Lester Siegal. Goodman is witty with pitch perfect delivery, understanding the importance of adding levity to a very intense film, and Arkin just steals the show through his attitude, showing that age doesn’t slow down a great actor. Arkin is a shoe-in for another Oscar nomination, and rightfully so, although the Supporting Actor field is going to be jam-packed this year. But it’s not just Affleck, Arkin, and Goodman that give memorable roles in ‘Argo’; the whole movie hinges on the actors and actresses playing the American refugees, who are given a very tricky task. By giving to much visible emotion, the characters would seem cowardly and exaggerated, and by not giving enough, the film would ring false, but these six actors and actresses strike the chord between fearful and courageous. Specifically, Scoot McNairy gives a dynamite performance as the cynical Joe Stafford. Although the audience is at first resistant to Stafford, there are some very powerful moments where we realize that this is a man that wants to protect his wife, as well as someone who feels an intense amount of guilt for putting her in this situation. This can all be attributed to the subtleties of McNairy (who I’m excited to see in ‘Killing Them Softly’ next week). However, the one prevailing thought that I had after seeing ‘Argo’ was ‘Wow, that Ben Affleck guy sure can make a good movie.’ After seeing ‘Gone Baby Gone’, ‘The Town’, and ‘Argo’, it is pretty obvious to me that the guy has an immense amount of talent, and I’m so happy that he has finally found his place behind the camera, where I think he is best suited. For a while, the joke of the day was always how Matt Damon was probably the real mastermind behind ‘Good Will Hunting’, and Affleck really just put his name on the thing, alluding that Damon was obviously the better actor. But, in the end, Damon might be the better actor, but Affleck is the better movie maker. Now that we’ve seen his expert understanding of character, story, theme, and entertainment, are we so sure that Damon wasn’t the one mooching all along? What I really love about ‘Argo’ is that it showed us something that we did right; how we were able to save lives without violence, and how we were able to use our creativity to solve the problems that the world throws our way. I love how no matter what you believe about today’s America, we can agree that what was accomplished by Tony Mendez in Tehran was nothing short of miraculous, and it’s something that should make us proud to be Americans… and Canadians. My Note: ‘Argo’ is simply a Hollywood gem; an instant classic!